Mario Tennis Aces is serving fans a real treat when it hits Switch consoles later this month. During the Nintendo Treehouse stream at E3, we were shown Adventure Mode; a delightful return to the series’ story mode. Featuring a variety of courts in all weathers, Adventure Mode is the perfect way to hone your tennis skills. Playing as Mario, you’ll be tasked with several mission types that you’ll need to complete in order to advance through the story. Attempting missions will give Mario experience points, allowing him to level up and unlock new rackets to store in his inventory. Challenges often vary too, with court obstacles, weather issues and boss fights served up in style. Appearing in blooming good fashion was Petey Piranha. He deals some vicious tornado attacks but rallying with him for long enough will enable players to knock him down and hit his sweet spot. On August 1st, Koopa Troopa will be available to all players who participated in the online demo tournament, while Blooper will be available in September. So it’s a good idea to get some practice in while you can! 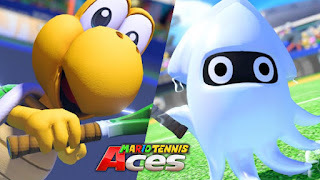 Mario Tennis Aces will be available on Nintendo Switch on June 22nd.